Google uses other forms of data to measure how high you rank and how much visibility you should have. Now it is better just to be honest and transparent. Contact us now to discuss your domain name. The thinking on Exact Match Domain Names has changed recently, so this is a good time to look at domain names again. If you are starting a new venture, or a new division of your existing business, or perhaps you are rethinking the whole of your marketing strategy because you have a website that is not performing, a domain name is one of the first things you should consider. Do you use your brand name, or do you try to add the keywords into the domain name to give you a head start in Search Engine ranking? With some businesses it may be possible to research your keywords, choose a domain name, then call your business by that name – ideal. 6 to 8 years ago I would have said that keywords in the domain name, with hyphens between the words, was the right approach – www.keywords-in-domain-name.co.uk. We even did some sneaky things like using a Vanity Domain (www.myname.co.uk) on all the marketing material, and in the background forward this domain name to the Search Engine Friendly domain name with keywords. This worked at the time, and is still getting traffic now. So why is this not what I would recommend today? Search Engines now are much smarter than they were back then, and Google uses other forms of data to measure how high you rank and how much visibility you should have. Now it is better just to be honest and transparent. 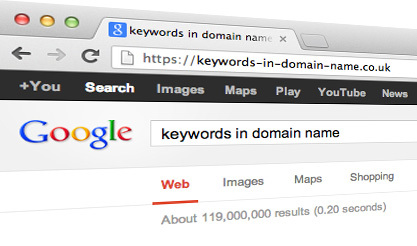 However, keywords in your domain name will have an influence if they are part of your business name, but it is not as important as it used to be. To find the best keywords for your business to concentrate on, have a look at this post. The next step is to locate available domains. Start brainstorming and write down several variations of the top 5 or so keywords for your market. Plug these variations into keyword research tools to see traffic estimates and remember to specify exact in the search. If you’re pleased with the amount of search traffic, start checking if they are available for purchase or if they are already taken. Remember to make them readable. Typically, popular keyword phrases are not available, and if they are, the price for a premium exact match tends to be significantly higher. There are various places to look for premium domain names if you search for them. If all of the extensions are taken for the phrases you’re typing in, you might want to consider using a catchy name with only one of your major keywords in the title. You still have a keyword in the domain and it might actually work out better for you in the long term if you focus on a catchy name that is good for branding rather than exact match traffic. Remember exact match traffic is not a sure thing! If you think you can buy a domain name that gets a ton of exact match traffic and sit back and get rich, you need a reality check. Just because you buy an exact match domain doesn’t eliminate the hard work that it takes to actually start ranking for your keywords. This is especially true in a saturated market. Buying an exact match only increases your chances of ranking but remember, it doesn’t guarantee them.